Work continues on the house. Real Builders was in and measured for the beams to go in. They are ordered and should be going in soon, hopefully this week. They will also rebuild another load bearing wall and reposition a doorway in that wall. We have connected with All Points Construction. Once the beams are in and walls are removed in the basement All Points will pour the concrete. Either just before or after it dries for a few days they will also power wash the basement and treat it with a mold inhibitor. All Points have some people from Idaho and some local. They appear to be very knowledgeable and have all the proper credentials. They are working on 5 or 6 houses in Eastwood Park. One is our neighbor to the north. All Points is rebuilding their basement and front porch. We will probably use them to replace our back door and after we have electric, to also replace the kitchen floor and install cabinets. 1912 Dance Restrictions – From the Reporter on Nov. 13, 1912… For dancing the “bunny hug” and “grizzly” bear, which had been banned in many dance halls in the country, a young man was sentenced to 10 days in the Minot Jail. Officer C. Younkin, assigned to special police duty at the Riverside Dance Hall, preferred a charge of disorderly conduct against the youth. The latter’s partner in the dance floor, who got away from the officer, was being sought. 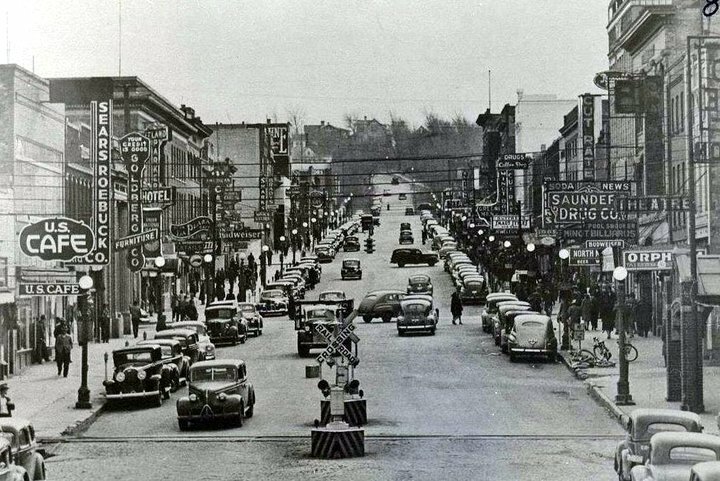 An ordinance on the books in Minot – When Minot got its first paved streets, which consisted of wooden blocks, the city fathers prized them like a zealous housewife does a newly waxed floor. All precautions were taken to keep the paved streets pristine. – No garbage was to hauled on or across the streets unless absolutely necessary to remove it to or from an alley. The fine was $5 and up to 10 days in jail. By the way, in bad rain storms and it the streets flooded, the wooden paving blocks were known to float away. 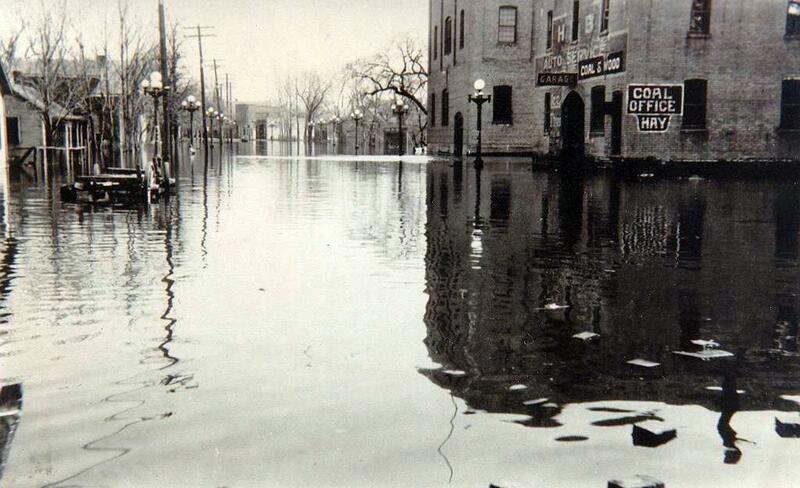 The picture below shows the wooden paving blocks on Central Avenue floating during the 1923 flood. The main floor of the house is washed down. There is still a few nails to pull in the kitchen floor. The back dressing area needs to be done. A bit of lathe and plaster behind moldings need to come out in kitchen, back area and bathroom on main floor. Then the rest of the dining room wall will be stripped between the windows so we can add insulation. The front door has dried out enough so it will close and lock. The back door is still locked with a chain. If all goes as planned, a contractor friend of mine will stop over today to take the measurements for the two beams to be put in. Hopefully all will be done by this weekend and then we can get concrete in..
Einar Muus – (from a Minot Daily article on Nov 20, 1936). 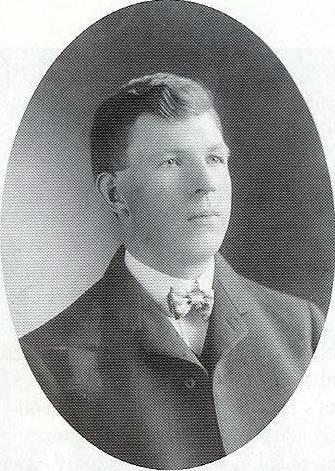 on May 15, 1897, Einar Muus arrived from Norway with his older brother Jacob. Is first job was the Great Northern Railroad. In 1899, Einar went to work for Muus and Welo, a mercantile store in Velva that his brother John had part ownership in. 1900 was Einar’s “covered wagon year.” He used the wagon as a portable store, taking general merchandise to the farmers. At 19 he got a job as bookkeeper with T. P. Kulaas in the Kulaas Lumber company. The Minot School Board needed a secretay, so Kulaas, without consulting him, recommended Einar. He got the job. 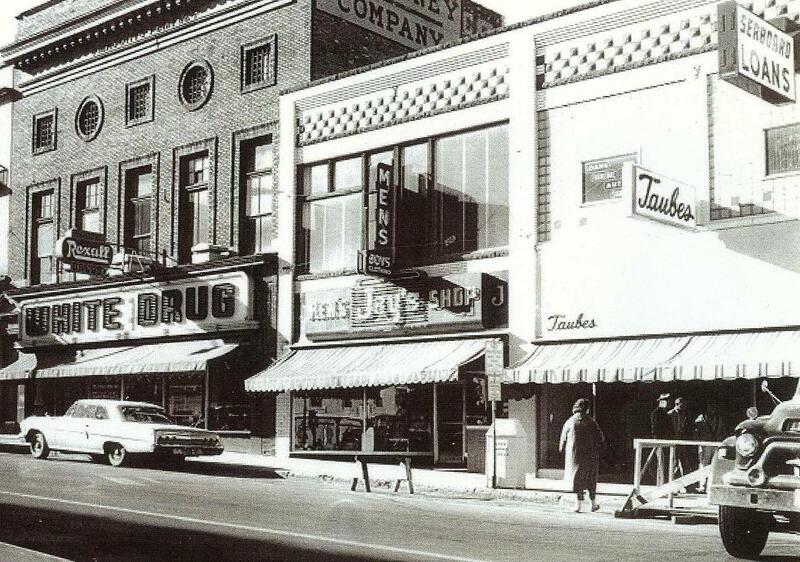 The Kulaas Lumber Company was on Central Avenue, in the middle of the block behind what is now the Taube Museum. 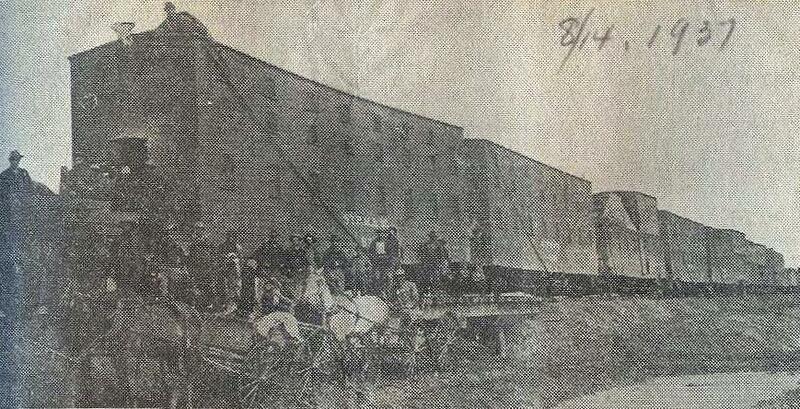 Kalaas remained in the lumber business until 1904 when they sold out to the Bovey – Shute Lumber Company. In the spring of 1905, the Great Northern Lumber Company was formed with Einar Muus as the manager, in the same location on Central Avenue. 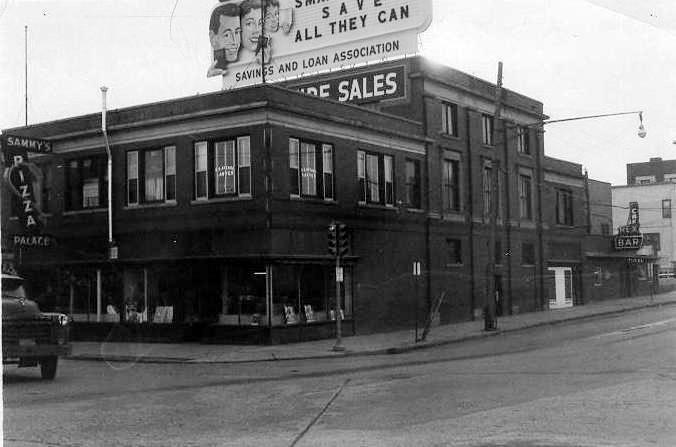 In 1917 the entire stock of Bovey-Shute was purchased at 201 Central Avenue. 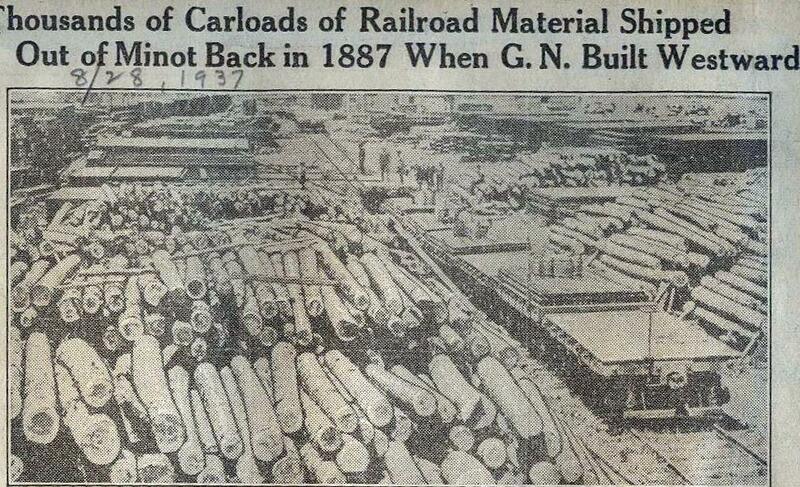 The Great Northern Lumber Company continued until 1930. After the death of O.P. Nustad, the name changed to Muus Lumber with Einar as the sole owner. Pictured below is Einar Muus. 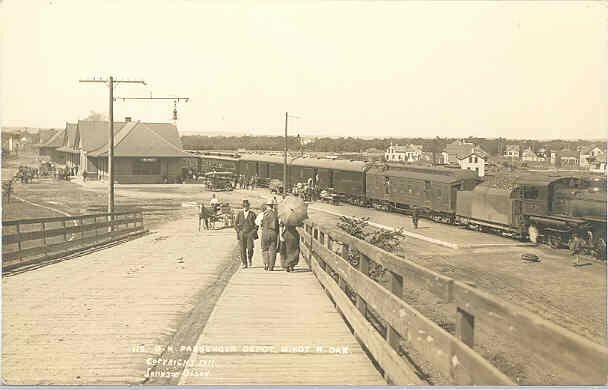 The other picture shows the Great Northern Lumber Co. in the background. The horseman on the left is Jacob Muus. 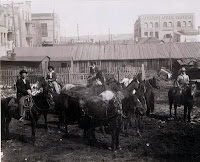 The stable would be about where the Clarence Parker parking lot is today. Aug. 2, 1938 - Jani Green Timlin was back in Minot after spending the last year under contract to Brown & Bigelow Advertising in St. Paul. She has posed for all the Coca Cola advertising, including a calendar. In 1937, a board comprised of leading theatrical personaliies, chose Jani as the “ all American Girl.” She is living in Minot with her parents. Her father, M. R. Timlin, is a representative in Minot of the Northwest Beverage Company. She has posed quite often for Earl Moran in New York who specializes in painting beautiful girls. Buffalo Bones Revived – At one time vast herds of bison roamed over the Mouse River and Des Lacs valleys. Sometimes when the herds would go down to the river to drink, the older, weaker animals became mired in the mud and remained there to die. The bones of the animals could be found in the water and often in the dry bed of a river or lake after the water receded. Picking buffalo bones off the prairie in the late 1800’s was a way for many homesteaders to provide themselves and families with many of the staples needed for living, things such as flout, coffee, bacon and other necessities. 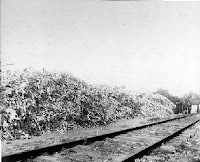 The bone industry was at its peak in the late 1800’s when thousands upon thousands of buffalo skeletons were hauled to Minot off the prairies and piled up next to the railroad tracks. 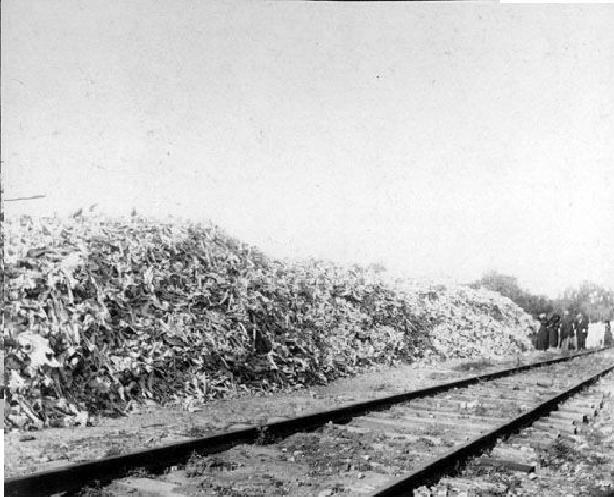 At one time so many buffalo bones were piled next to the tracks in Minot, the railroad put in a spur line to get the rail cars closer to the pile for loading. The bones were then shipped to St Louis or Chicago. 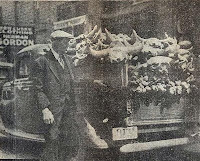 In 1937, buffalo bones were still worth money, about $10.00 a ton in Minot. The bones were used for various industrial purposes. In the early days the bones were used for fertilizer and in the process for refining sugar. 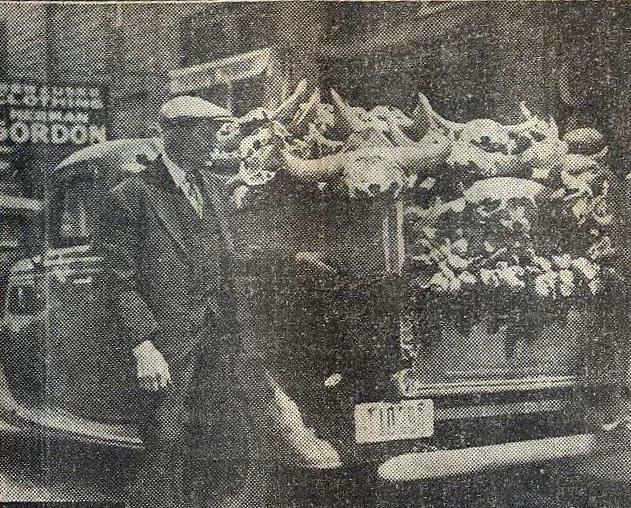 Getting buffalo bones in 1937 was a bit more difficult. The more modern day bone pickers almost had to become miners. Sometimes it took a pick and a shovel to retrieve the bones. We went to the house last night after work. Pat was able to get all the staples removed from the living room.... staples were in the pad below the carpet. I was able to get all nails removed from the base molding I removed from the main floor. Some of the base molding will have to be discarded. We saved as much as possible as it is quarter sawn oak. We received our 1st estimate from an electrician and a heating and A/C contractor. Wiring estimate for basement and main floor just under $20,000. The Heating and air conditioning estimate for 2 furnaces and new A/C was about the same ,just under $20,000. Today I am going to meet with a local builder about installing a beam where the load bearing wall is. Yesterday, a structural engineer was in and took measurements. He will give me ideas on what to do also. Once that is done we are ready for concrete. We are supposed to get a call today from the Southern Baptist power wash team about power washing the house. In 1937 the Minot Post Office was 50 years old. Prior to its establishment in 1887, the post office for Ward County was located in Burlington. At that time the post office was a box carried by the Burlington Postmaster, Attorney James Johnson. 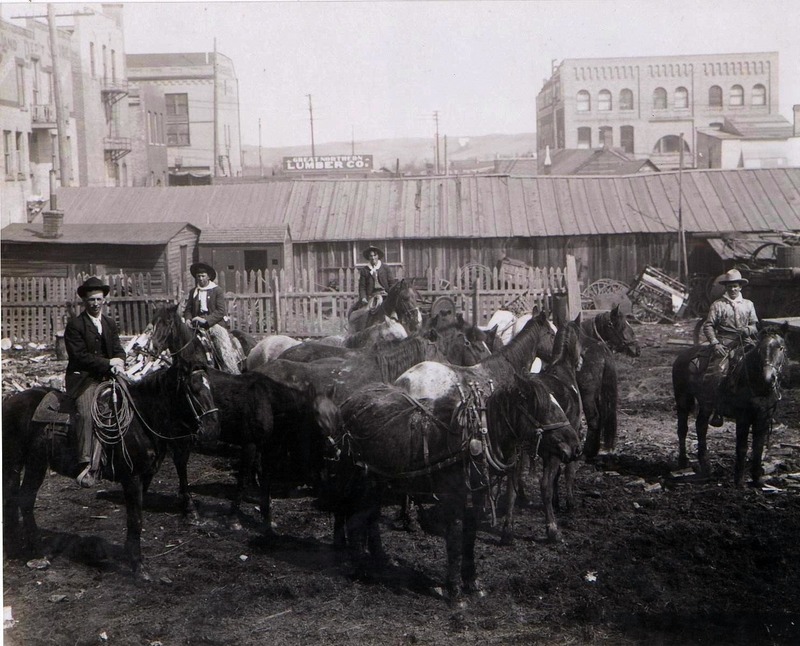 Prior to the Minot Post Office, people up and down the river went to Burlington for their mail. In Minot in 1989 the Postmaster’s salary was $100 a month and his operating budget was $30 a month for rent and $10 a month for fuel. In 1903, rural mail deliveries were started out of the Minot post office and in 1904 city carrier service was started. The post office became first class in 1908, declining to second class in 1911 due to business reasons and back to first class in 1912 and has maintained that level since. 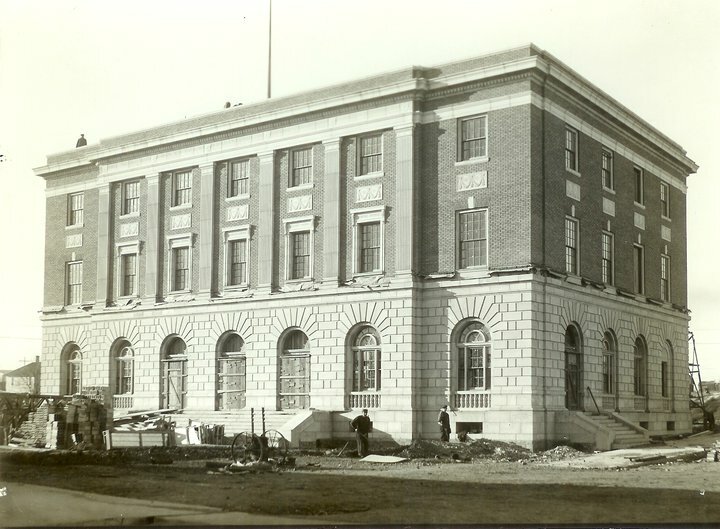 The Post Office, now the Federal Building, was completed in 1915 at a cost of $150,000. The post office moved to its present location in the 1950’s. 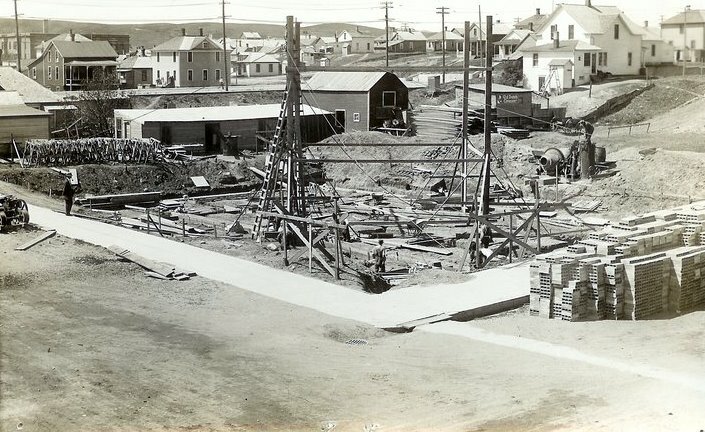 This location prior to the post office being built was a flat piece of land used by Minot High School as an athletic field. Violin Maker in Minot – in 1937 J. C. Jarrett was making violins that were diffetent form the conventional instrument. His Violin did not have a sound post as did most others. According to Jarrett, a sound post is used to improve the tone in vioins in which the wood and design are not in perfect acoustical harmony with the strings. Jarrett felt his instrument is acoustically perfect in all its tones so no need for a sound post. The neck of the violin was an inch longer to facilitate the the playing of half tones above the open strings. The wood for the violin was rock maple imported from Europe. To determine the musical qualities of the wood, it is struck with a steel hammer before any work is done to it and while it is still in block shape. The wood had to have a silver, bell like tone to be used. The tones would determine the thickness of the pieces to be carved. The cost of material in 1937 was about $100 per violin. The estimated value of the completed violin was $2500.00. I took the day off yesterday. Had to let the body rest for a day. I did not realize that I could have so many aches and pains in so many places all at the same time. We went and bought supplies and groceries for the farm. I will go by the house this morning and then again tonight on the way to the farm to empty the dehumidifiers. I may have to meet the engineer and an electrician today for estimates. I am thinking that in the long run it will be better to use a local electrician as I may have to rewire in stages. Some of the basement will not be able to be done until after the concrete is poured and new walls are built. I was at a neighbors yesterday and checked out the beam he built and installed in his basement. We will do something similar but it will be longer than his. Ours will be about 24 feet. The only lathe and plaster to finish is one side of the doorway into the main floor bathroom and the linen closet at the end of the hallway. Then the main floor will be done from the floor up four feet. As time goes on before rewiring we will take out more lathe and plaster. We will go higher in many if not all areas. Right now we are stripped down about a 18 inches above the water line and about a foot above the mold line. Work continues in the house. Wednesday, Jim Hatelid, a fellow city alderman, came over and helped Mark and I remove lathe and plaster behind molding. On Thursday, yesterday, Tom Hinzpeter showed up and we removed more and also much of the lather and plaster in the pantry. Today we will continue with that but first another wall will be removed in the basement. This wall will open the furnace room into a very large room that will give the furnace people and plumbers more room to work. The extra floor jacks I ordered are here so I will pick them up at Muus Lumber this morning. I was told now that heating ducts can be cleaned and do not have to be replaced. I imagine this is to expedite people getting heat into the houses before it gets cold. I have a company from Grand Forks scheduled to do this on the 25th at noon. We need to get a power wash done first. Still waiting for the Southern Baptist team to come and I have a line on another company in town doing power washing. I am still trying to get an engineer to look at the possiblilty of installing a beam in the center of the basement for more support and to open up the area. it seems like it could be done and there are concrete footings in place to use as a base. The decision has been made on the kitchen layout.... will order after we get and electrician in and wiring is done. We still have to pick out a new back door to be installed by a carpenter. The house itself is getting close to being done.... still have the garage to finish up. 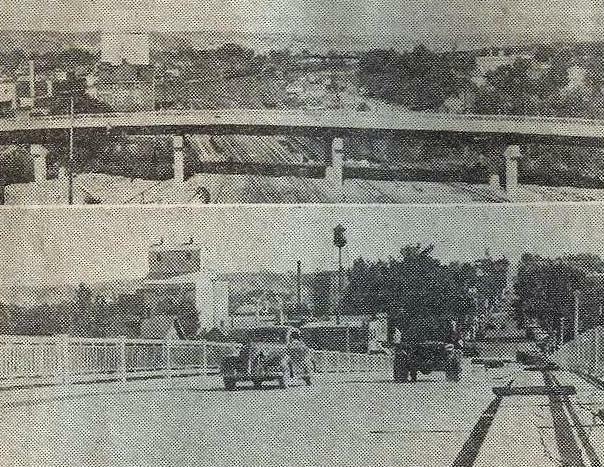 Third St. Viaduct – July 30, 1937 was the formal opening ceremony for the Third Street viaduct in northeast Minot. The viaduct was the overpass over the Mouse River and the Great Northern tracks. The overpass is 911 feet long and was built at a cost of $221,000. The opening ceremonies were hosted by City Manager Jay W Bliss on the south side of the structure. State Highway Commissioner, P.H. McGurren declared the overpass open and part of an improved highway system the state is putting into place. 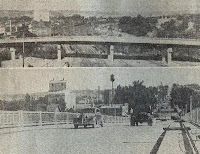 The dual picture below shows the completed overpass from a distance and some of the first vehicles to use the overpass. The End of the Great War – The first place to receive the news that The Great War ( WWI) had ended was the Minot Daily News. It was about 2:00 am Minot time. The editor received a message at his residence that the Armistice had been signed by Germany. By the time the whistles started to blow in the early morning hours, the Minot Daily News had thousands of “Extra’s” on the streets. The city went wild with delirium. One man tied a rope to a cowbell and ran through the streets. Make shift floats and parades were quickly assembled to celebrate the news. The City Auditor at the time, Hagenstein, and a group of patriots gave speeches, many interspersed with the song, “Hail, Hail, the Gang’s all here.” Many businesses closed as well as the Minot City offices. All had signs out stating. “Closed today to bury the Kaiser”. Pictured below are men getting ready to board trains to leave for WWI. Brother Mark is here and work is continuing in the basement. One half of the basement floors are concrete. The rest of the floors, (about 800 sq. ft), were wooden floors built on 2X10 floor joists that were on the ground. The floor joists have been deteriorating for years and the floors needed to come out. The big room in the basement where my shop was had layers of floors. On top were 2 plywood layers. Below that was a 1x4 floor that Chuck Barney and I pulled out and the bottom layer was a 1x12 floor on top of the 1/2 rotten floor joists. All has been romoved. Mark and I pulled out the last of it yesterday. We also found that the bottom plate on one of the support walls had rotted away. Not much support there so I ran to Muus and picked up a couple jack posts to make sure there was some support. A friend came by and gave me the name of a small, local contractor who does concrete work..... I had called 7 others with no response from 6 of them. One said he could pour the basement floor next year. Pat and I met with Josh from Double J and he will be doing our floor, possibly within a month and at a better price than I was expecting to pay.... It will still run about $9-10,000 to have the floor put in. He has a contact who may be able to replace the support wall with a beam. This will really open up a large portion of the basement into one big room. Josh also does landscaping. We will have him remove the top layer of our lawn to get rid of all the clay so we can start over again next year on that. The weekend was most productive. On Friday morning, 3 people from the Samaritans Purse came to help for a few hours before they left town. They found out I was working by myself and offered a hand. Two ladies from Michigan and one young guy from North Carolina. By 11:00 am they had the kitchen walls done. About 10:00 am John walked in and asked who the home owner was. I told him it was me and he said "we are here to help". He and 11 others were from a Mormon Church in Wyoming. The group was like a machine going through the house. By 7 pm the basement was empty, most of the floors and everything else. The main floor has all the sheetrock and lathe and plaster out up to the 4' mark. on the outside walls we went all the way to the ceiling as there is no insulation in the walls at all. There are still some nails to pull and bits of lathe, plaster and nails behind the window and door moldings. These people were great and helped immensely. In the kids playroom in the basement we had a surprise when the floor was removed. The wooden floor was built on floor joists setting in the dirt. Through the years, the floor joists and wood floor had started to rot away. So out it all came. From The Newpaper on January 15, 1934… Demonstrators entered two Minot grocery stores to protest the price of mile on their counters. Chain Grocery on 2nd St NW was visited by approximately 50 people. Minot Food Market, also on 2nd St, NW was visited by the same group. At the Chain Grocery store, the protesters dumped about 100 quarts of milk on the street. At Minot Food Market about 20 quarts of milk were dumped out in addition to a small amount of cream. The reason for the protest was these two stores were selling milk at a price lower than the group wanted. The average price for milk at that time was nine cents a quart. Chain Grocery was accused of selling milk four quarts for a quarter and at times seven cents a quart. Minot Food Market had a sign in the window stating “Free milk with the purchase of 50 cents of groceries. The group was representing the milkmen’s organization. Super Grill – Located somewhere in the area of 627 North Broadway… Few people remember the Super Grill on North Broadway. The Super Grill was located next to the Super Value Store on North Broadway…. The Super Value Store eventually became Northwest Music until the building was torn down with the upgrades to North Broadway. In the 60’s and early 70’s there was also a Super Value store on south Broadway with a cafeteria on the south side of the building. The café is now a used car lot (Coach & Four). The grocery store closed and became Northwest Sporting Goods and is now the Goodwill Store. Yesterday was a productive day. I ran into Mike Berg, (of B&B Drug fame), and he offered to come to the house to help. Since the rolloff dumpster had not been emptied, we decided to tear out the kitchen. By 3 pm it was gone. we trashed the base cabinets and saved the upper cabinets for future use in the garage or whenever I get another wood working shop. We then snapped a chalk line at 4 feet all around the main floor rooms. All sheetrock below that line will come out. I am going to run a saw around the walls at that height to make an even seam. Today I am going to remove all the 1/12 solid oak base molding on the main floor. I am going to label them on the back so we can reuse most of them, hopefully in the same place they came from. Once that is doen I will try to finish off the little that is left to do in the basement. One set of base cabinets in the back room and some lathe and plaster. A lot of nails to remove in all the studs in the basement also. .... if I get all this done, I will call it a day. Sammy’s Pizza on Central Ave. – The Sammy’s Pizza in the 60’s was located on West Central Avenue. About 2 doors east of Broadway. The booths were in the back. The pizza’s were made in the front of the place next to the windows. I recall dough being tossed in the air during the Pizza making process. Next door to the west in the early 60’s I have been told the corner spot was the Bus Depot. The Bus Depot moved and in the late 60’s this area became Poor Roger’s Surplus (I believe the name is correct.) The only thing I remember about the store is that it seemed to have a continuous “Going out of Business” sale going on…. Eventually Poor Roger’s Surplus did actually “go out of business”. The Tempo Store was on the north end of the Arrowhead Shopping Center, where Marketplace Food is now. It was a department store of sorts and as I recall was competitively priced. Tempo and Red Owl at one time were owned by the same parent company. During my time as Assistant Mgr at Arrowhead Red Owl, we would send new stock clerks on a quest for the aisle stretcher to make room for freight. When it could not be found in the Red Owl Store, we would send them to Tempo to look for it. I went into Tempo in the mid 60’s to purchase a stereo system for my 1965 Mustang. I debated on getting a 4 track or going all out for an 8 track. The 8 track won as I decided to be on the cutting edge of technology. While there I was also witness to a new invention Tempo had just started selling. It could make popcorn in a matter for minutes… the new invention was a Microwave oven. Except for a few large objects, the basement is finally cleaned out of "stuff". Also, the bathroom needs to be done.... vanity, shower, jacuzzi tub and toilet. Now it is time to start removing sheetrock amd nails or screws. I removed small amounts of sheetrock in some areas of the basement. In some walls the only insulation was a layer of 1/2 inch bead board.... not much "R" value there. It should be much warmer when we get it done and have the second furnace in. The 3rd roll off dumpster is about 2/3 full. by Tuesday night it will be ready to be dumped again. The floor in the basement is 3/4 inch plywood. In some areas it is flat , in other areas it is warped. or at least the top layer.... not sure yet if the walls are built on top of the plywood. It could cause a delima if we pull up the floor. Sunday morning and we are getting ready to head into town to work on house. The basement is close to being emptied of stuff..... starting to fill our 3rd roll off dumpster. Will finish removing items... some I need help with as they are too heavy for 1 person. We still have to get the bathroom apart... jacuzzi tub and all.... then off comes the sheetrock in basement and main floor. Kitchen cabinets are out next. Saving the upper cabinets for future shop or garage.... disposing of the base cabinets. New kitchen layouts shoud be ready to view in a day or two..... Pat and Grandaughters are heading to the cabin by Detroit Lakes on Thursday morning for 5 days.... I am staying behind to continue with the house. Not sure what is happening with houses with collapsed basements. Next door neighbor has north side collpased and 4 or 5 floor joists are cracked. His south basement wall is starting to bow our. Hope the house stays up... it is leaning away from us. Neighbor across the alley to the west of us had his south wall cave in.... a few days ago the north wall of the basement also caved in.... this house may not be saved. It seems as though yellow caution tape means structural damage and unsafe... Red caution tape means hazzardous waste.... asbestos or something similar. we had a house a block away that has been red taped and people in hazmat suits are cleaning up area. The Mad Max trucks have been through the neighborhood and a lot of the debris is gone. I call them the Mad Max trucks because to me they look like something out of the Mad Maz movies. I am still waiting for the Southern Baptist mud out teams to arrive. I received a call from the Mormon church offering help. I will probably take them up on the offer as soo far it has been me by myself with help from Pat. I am getting pooped out. This café was located inside the Clarence Parker Hotel in downtown Minot. 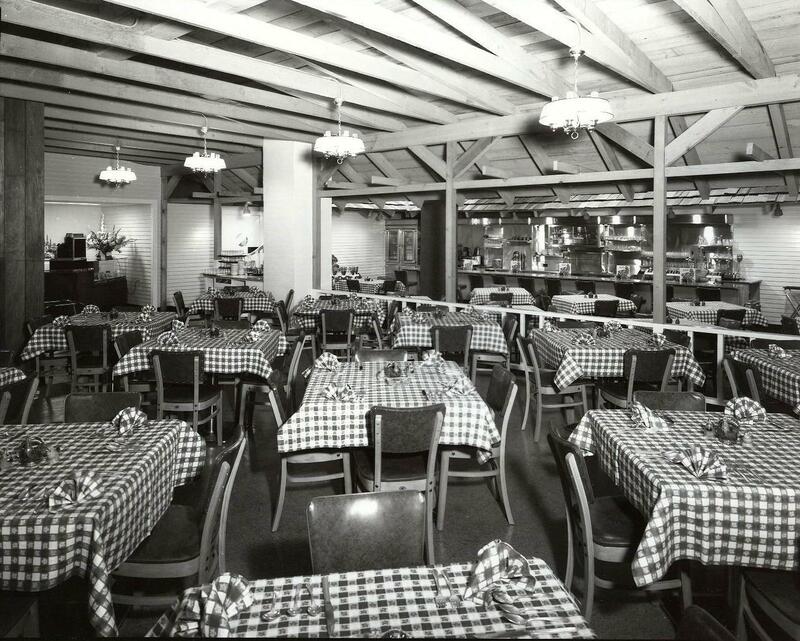 Both the Clarence Parker and the Leland Parker Hotel had café’s in their hey day. The Clarence Parker Hotel actually began as an office building. 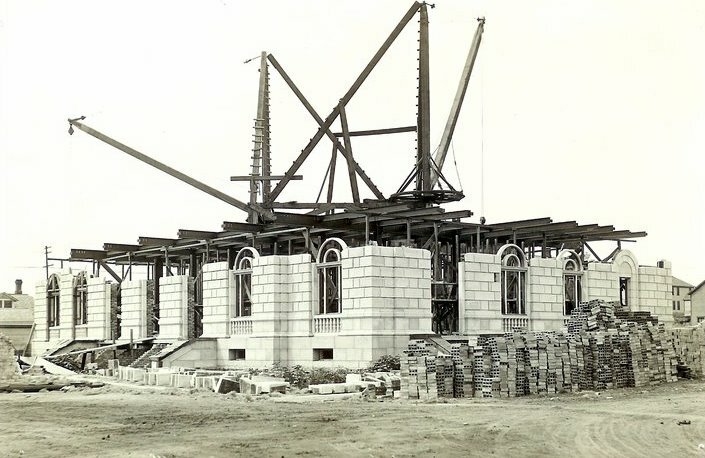 George Valker, Sr. started construction on the office building in 1920. It was never finished and was left vacant for about 20 years., except for birds roosting in the incomplete top stories, hence it was known as the “Sparrow Hotel”. After WWII, Clarence Parker completed the construction and created the Clarence Parker Hotel. 45 days out of our house and counting. The basement is almost cleared of all the stuff that we did not have time to get out. Not the best way to do spring cleaning as a lot of things went that should have been saved. The second construction dumpster will be full tonite and then I will start on number three. When all items are cleared out then the sheetrock walls and ceiling demolishion will begin. Both in the basement and on the man floor. Darla from Muus Lumber will have some kitchen plans for us to look at by early next week. All for now.... Have some radio work to do before I head to the house. 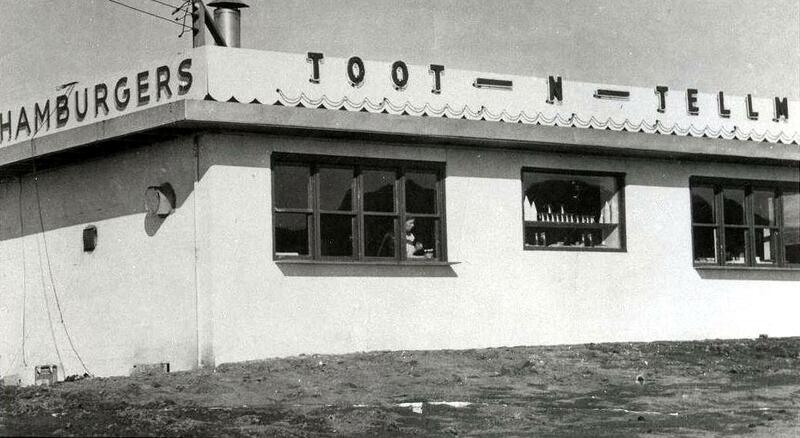 Toot & Tell’em – This apparently was located on the bottom of North Hill on North Broadway. The premise of the drive-inn was to pull up and “toot” the horn, then “tell-em” what you wanted when they came out to take the order. I believe this was at the same location as the Twist Inn. I’m not sure which came first. Things are progressing in the basement cleanout. 2 1/2 rooms to clean out the remains and then off comes the sheetrock. Most of the ceiling is down, the flood took care of that. It will be easy getting it off the walls. When basement is done then the upstairs walls will be stripped of sheetrock and cupboards. It is a slow process. I am on vacation from the radio station. I drop Pat and Dacotah off so she can continue to work while I go down and clean out the house. We have filled one consturction dumpster so far, working on the second. It will be great when the "Mud Out" team arrives to help. they will help finish the cleanup and sheetrock removal, then power wash and treat with mold chemicals and then we need to dry it out. It is good that the house will be rewired as I am seeing a lot of old style wiring now that the ceiling is down in the basement. We will be making a few modifications when we put the basement back together. At one time there was an Oppen’s Grocery Store o Central Avenue, where Val’s Cyclery is now. The one I remember best was on Valley Street , where the Work Shop laundry facility is now located. As a kid spending my summers on my Grandparent’s farm on top of Speedway Hill, I remember shopping at the Valley Street Oppen’s every Friday after selling eggs to Trinity Hospital. Now there was also an Oppen’s Grocery on South Broadway where the Goodwill Store is now located. 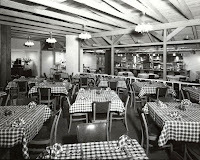 When the South Broadway store opened, the cafeteria was on the north side of the store. I have a picture showing this. Later, this store became South Hill Super Value and the cafeteria was moved to an addition on the south side of the store, now the home of Coach & Four auto sales.